When I first met Liang Wei, it was about three years ago on the boarded piers of the Seattle waterfront. I was peddling a single-speed pedicab, or a Western version of a rickshaw, rented out to users for the purpose of picking up customers and ferrying them around for extra change. An interesting job? Not as interesting as those of the people I got to meet. Close to a restaurant called the Old Spaghetti Factory opposite Pier 70, Wei came along with two of his friends, Chinese art professors Liao Lei and Wang Lin, of the Sichuan Academy of Fine Arts in Chongqing. They were only on a brief visit to Seattle and wanted to see all the tourist sites. I’d travelled to China once as a teenager, and I still spoke some Mandarin. When Wei introduced me I was able to chat with them all for a minute. They quickly departed after going for only a short ride and snapping some pictures. I remembered Wang Lin’s name, but I soon forgot the others. More than three years later, I am friends with Liang Wei and have visited his family’s home in Chengdu and seen a variety of his new works on commission. I’ve met lots of his Chinese friends. It’s strange to think that a tall Westerner in butterfly wings got interested in the Middle Kingdom while peddling three Chinese men in a rickshaw, but I’ve been basically obsessed ever since, and have spent much of my time in this country being ferried around on those three-wheeled carts myself. Liang Wei was born in 1959, in Suining, outside Chengdu. As early as 5 years old he displayed a strong aptitude for art. His parents bought him many sheets of paper and pencils and watercolor sets to kindle his desire. A local primary school teacher carefully instructed the boy to paint fish, flowers, and bamboo stalks in the traditional style. His teacher and classmates enjoyed watching him work, and he was greatly admired for this skill. His interest continued, shared by Wei’s youngest brother, until approached high school graduation in 1976. At this point, Wei was sent to a forced reeducation camp in the Liangshan Yi Autonomous Prefecture in southern Sichuan. Forced labor was a common experience for men and women of Wei’s generation. Liangshan is home to many of China’s ethnic Yi people, a minority group. Being an artist, Wei worked among the Yi and was inspired by his mountainous surroundings. He was selected by the county cultural department of Puge (pu-guh) County where he was living to make “creative artwork”. What this actually meant was working for the central government propaganda office, at the time in need of artists to produce propaganda. 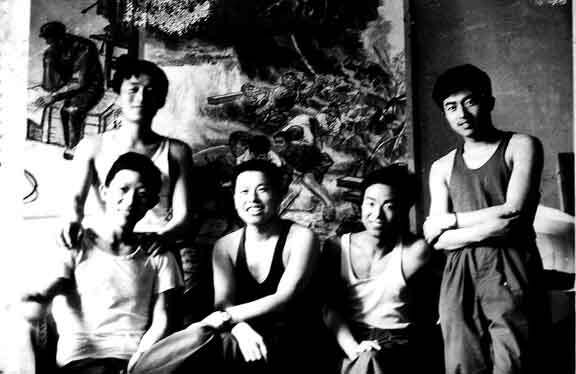 China’s central government at the time was still under the influence of the Si Ren Bang or Gang of Four (known by anyone who has studied the Cultural Revolution). Turned down for this position, Wei, after two years of forced labor, entered the army in 1978. He worked as a shibing (soldier) for a total of four years until 1982, right after the implementation of the Four Modernizations in military advancement. His division’s specialty was building tracks for the army railway. 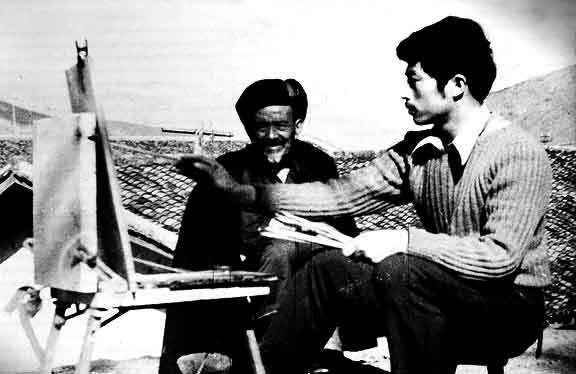 While in the army, Wei was selected to make propaganda for the central government. He was called to the PLA’s Beijing headquarters to collaborate on artwork for a soldiers’ magazine- part of an annual art exhibition held in Beihai Park. The group founded by his collaborators was self-titled Dalu Ban Hua Hui, or the Society of the Road or Railway Society. During China’s time of internal political struggles and external struggle with Vietnam collaborative groups of artists were frequently giving themselves names. Once the boy who once stood up in his middle school class to do art demonstrations in the absence of the teacher, Wei was now responsible for the army’s representation to the public. Wei had a brief rest period, during which time he served a stint as a government office worker before his acceptance and enrollment at Sichuan Academy of Fine Arts in 1982. While earning his BFA, he received highest honors from the institution. Upon graduation he was invited by the school’s president to show his work in a two-man Academy exhibition. This exhibition marked an important step in the progression of the artist. Among the works displayed was “Memory of Liang Mountain,” a detailed painting appearing with a deliberate, rich symbolism. Elements of this painting, being autobiographical, speak to Wei’s more recent work. A coincidence is that Liang Wei’s art often reflects not the beauty of his own land of origin, but of mine- the Pacific Northwest, United States. Wei has kept a studio in the Seattle area for 20 years, as well as one in Shenzhen, taking breaks from his work to travel cross-country and go to and from China. A bond exists between the Pacific Northwest and central/ coastal China that extends far beyond the life of the artist, however. Many tens of thousands of Chinese immigrants dwelling in the western coastal USA can testify to this, not to mention the tourists who flock each year from every part of Asia to admire Mount Tahoma’s soaring peaks, the Douglas firs and spruce and Ponderosa pine trees, the snaking bends of the Columbia River and jagged edges of the Puget Sound. A large trade relationship exists, personified, of course, in the figure of Gary Locke- former Washington State Governor and first Chinese American US Secretary of Commerce, now Ambassador to China. I could go on and on drawing parallels. Why is this important to Chinese art? Most contemporary art historians will tell you that China’s art scene now crosses borders, extending transnationally- being one of the dominant art scenes in the world. A Chinese American who lives partly in Sichuan, partly in Seattle, can speak transnational life of an artist, characterized by personal experiences of some of the major social and historical upheavals of the last half century, are important to what makes him contemporary. His life and work are like one, part of a larger picture of the contemporary world. In 2010, Wei exhibited “Mysterious and Magnificent” at Shenzhen’s Guang Shang Yue Art Gallery, a series depicting his travels through the American landscape. Rolling clouds and shadows cast by jagged or rotund trees and land formations tell the viewer that the artist has surely travelled to the rugged places depicted. In 2011, Wei prolifically turned out another, related exhibit, entitled “East Meets West”. This series specifically points out parallels and contrasts in contemporary realities in the United States and China. As someone party to both cultures, he can articulately comment on each, showing scenes from Chinese and American life rendered in the same warm, distinct style. In the 2012 “Cross Arms, Cheers” series, Liang Wei depicts men, women, and even infants in questionable social situations- most frequently drinking wine from crystalline glasses. The subjects’ arms are linked together in a manner identified by Westerners as probably drunken behavior. In China, this behavior is usually reserved for wedding ceremonies. Drunkenness is acceptable at family and business gatherings between some colleagues. However, in the Drinking series, it is often unclear who is, and how many, are drunk. This drunkenness reflects changing trends in Chinese society today. It is implied through silhouettes of light that cling to the bodies of the moving subjects, their swaying forms appearing framed in sunspots. Glasses appear blurred, further enhancing the impression that the people holding them are unable to steady them. The hands holding the glasses seem anonymous, maybe belonging to the subjects, maybe to other individuals out of view. In the cases of couples, there is less romance than suffocation. The urge to drink seems less motivated by pleasure than driven by the desire to eliminate mutual discomfort. I like the Cross Arms, Cheers series: first, it reflects my own experience of drinking in China (somewhat uncomfortable). And second, the social commentary implied in it is real. Not until the last five to seven years, says Wei, has the gesture of crossing arms and drinking apparently been adopted for widespread use at business parties in China. In a sweeping embrace of formerly “loose” behavior, those of different generations and wealth margins appear together to be mocking what was once sacred. A ritual devised for the purpose of establishing and securing vows of love, it is now being held up for show- a joke. What this says about the changing face of the culture at large can be seen in everything from casual gatherings to large, serious affairs. Almost indiscriminately, the Chinese are making a mockery of their sacred wedding rite. This phenomenon is unique to present China. Liang Wei is aware of this major change, and the paintings in the Cross Arms, Cheers series are based on real occasions when the artist was present. In one of my favorite examples, “Toast for Birth,” a baby, still in swaddling clothes, is being propped up with a blissful smile. Everything suggests a healthy, glowing newborn. But this sense of peacefulness is interrupted by the appearance of hands supporting a partly-filled wineglass in the foreground. Whether the alcohol is intended for the child’s consumption or not, giving alcohol to underage children is now a common practice at Chines parties. In light of relaxed laws, the irony is not lost: the healthy infant is a wry symbol of Chinese opulence, as well as China’s pampering of its only children. Another example of infant pampering and questionable behavior is “Face Ocean”. When Wei showed me this image, he seemed to say that few moments in time have ever so encapsulated the Chinese relationship with their cultural and natural environments at this time. An infant, while playing on the beach, began to pee. 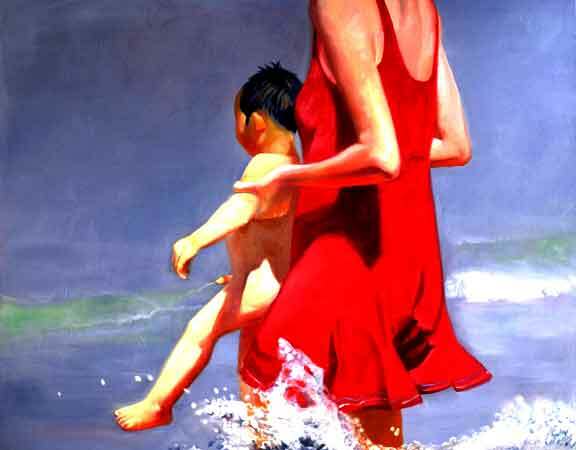 Uncertain what to do with her peeing child in public, the young mother quickly snapped up the baby and held him face-out to the ocean- a perfect, duplicitous expression of carelessness and the anxiety to do the “right” thing. Then there’s “Cross Arms, Cheers- Let’s Do It”. While the title suggests an energetic enthusiasm, the actual painting depicts an aging couple, stiffly holding up their wine glasses and encouraging each other to drink. The atmosphere is one of inebriated fatigue. Why does Liang include President Barack Obama in the Cross Arms, Cheers series? In “Mr. President, Cheers”, the President is depicted clinking glasses with a younger woman, whom Liang can positively say he has seen in real life: her face is based on a photograph. He saw her toasting and drinking a businessman in the same manner at a party. Obama is the only fictionalized character here. A Chinese-style silk jacket buttoned up to his red face, the symbol of Obama seems to doubly emulate the Chinese businessmen in dress and manner. From an American perspective, Obama throws doubt on the status of his office as President. But in the same manner, the businessmen raise questions about the sincerity of business being conducted overseas. Liang Wei seems to want to invite Americans into the conversation about international business conduct, without saying this. In a new China of relaxed social conduct and norms, where many traditional rules are being discarded, America also does a large amount of business. At parties photographed for this series, many foreigners were present. What happens, the artist seems to want to know, when there is no longer a clear distinction between the solemn vows of the traditional Chinese wedding and the drunken, exaggerated promises of transnational business? What is really being mocked- Chinese culture, or the business party? It is as if not only tradition were being profaned, but the profaners themselves. We are left to wonder how trust, love, and other human feelings can be secured in such an unstable, i.e. not sober, environment. Liang Wei offers no answer, but he prods us with the question and a dose of humor. Indeed, people caught in the throngs of the “wedding grasp” appear to have no answer themselves. The woman in the painting is no different from Obama: both have no idea what impact their behavior will ultimately have for the viewers, the beneficiaries of the business deal, or for weddings and traditional ceremonies in future China. It is one of the characteristics of an endemic culture shift, or major traumatic societal change, that those who are experiencing it are like hapless witnesses, unable to account for its effect. It seems that space has always been a key element of the art world in the United States: how often do Americans hear the words “art” and “space” combined? Without a proper location, art isn’t art- or it isn’t being displayed so that we can see it, so it thus isn’t integrated correctly into the landscape. In a country relatively free from restrictions placed on individual creative expression, public and private space, Americans don’t often reflect on how the divvied-up space is allotted, and on who controls it. When I look at the art of Liang Wei, I also have a sense of vast space, for if anything, Liang Wei is well-travelled. However, when looking at the pictures of the man in his youth, surrounded by other aspiring artists who lived on the brink of societal transformation, I think of his art as paired with a different element: time. 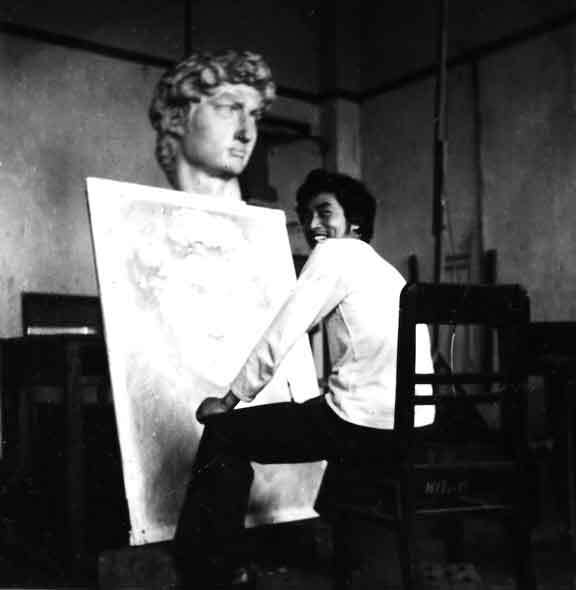 Time being on the artist’s side, over the long decades between the Cultural Revolution and the beginnings of economic liberalization, it was away from the immediate threats of a repressive regime that individuals concealed their creative lives. If Liang Wei worked within an oppressive system, his work nonetheless changed with the times, showing an insider’s view of the shifting social and moral landscape. And Liang Wei continues to change, as he travels from state to state and province to province, going to shows, selling his art, and promoting a positive understanding between East and West. Still, I think that space says everything- it is almost like a physical allegory for the psychological control and manipulation that dominated public life and private activities in China. If not impossible to get, space for artists during the worst years of authoritarian repression was imminently steeped in politics. 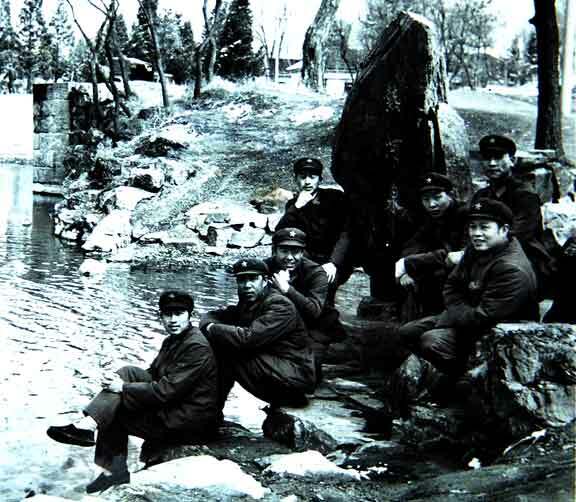 Spectators of subversive art, such as that of the Xing-Xing and Wuming Groups of artists, were also implicated and punished, as in the case of Behai Park in Beijing. As if to pound in the soul-crushing idea of propagandistic control, other types of art were and still are labeled “unofficial.” Thus, I see beauty in Liang Wei’s personal freedom of creative expression today. While he was a producer of propaganda in its heyday, painting American landscapes and social situations around him is like a lifting of the silence that once hung over his generation. While tides of upheaval swept China, Wei’s landscapes and portraits reflected a shifting world- an environment where new and old alliances and values disappeared, or emerged. Chinese artists once took great risks to provide intellectual nourishment to a population starved of it, and to supply the independent spirit necessary to make art possible and accessible. Today, Liang Wei makes art for art’s sake, seeing uniquely with the eye of an international contemporary artist. That would be a memoir. I’m not sure if I’d take you up on that. There are so many personal stories about Westerners in China. Maybe if it was really, really, really well illustrated I’d do it. What a great and well written piece. Chinese artists like Liang Wei (and others in his generation) are a testament to the power of creative energy and authenticity. They also tell a very important story in Chinese history. For the artist to translate such epic life experiences into these beautiful and socially observant (critical) paintings secures him into art history. As the author says, “Today, Liang Wei makes art for art’s sake” – there is no better compliment for an artist. I agree, in lieu of a search for “meaning,” it was a good idea to add that remark. Hangin with lots of artists in Chengdu has taught me much about the enjoyment of life… these guys really know how to do it. When not traveling or painting, they are ever at some social gathering with their friends. I don’t think the past decades were any different, other than regarding the availability of resources. But I do think those decades affected their work, as they affected everything. It is interesting how subtly the artists in the international scene have inserted references to those experiences when showing overseas. …and by that I mean, not only artists from the mainland, but from Hong Kong and Taiwan as well. They’re doing fantastic things conceptually, but keeping it in context, as if art created for personal pleasure could just characteristically, or habitually, have immense critical value. You ofter hear about arguments about how the Cultural Revolution squashed Chinese creativity and thought. What’s interesting about this article is the way it places the Cultural Revolution at the forefront of this artist’s development, and in many ways is responsible for some of the themes that continue to remain at the forefront of his artistic process. My mistake. “The Cross Arms, Cheers” series was exhibited as part of the international exhibition “Dialogue,” at Shenzhen’s Guang Shanyue Art Museum, in January, which featured artists from countries around the world including Germany, France, and Russia as well as native Chinese artists. The gallery in Shenzhen that hosted your solo show, “Journey Through East and West,” which has been translated by some galleries as “East Meets West,” in November 2011 is called Su Tu Gang Art Gallery. Thanks for the heads up! The more I research about the cultural revolution, the more I feel like it was not one event, but a series of collective, catastrophic experiences that transpired differently everywhere you went. In that sense, it was a different world for Liang Wei than for lots of other artists. But that doesn’t mean it wasn’t hard times. The thing to remember is every era has its imagery and image-makers, and regardless of who’s doing the making and who’s consuming the imagery, it will be a lasting part of history. The same is true today, with his recent series- very relevant to the new China. But art critics are always looking for a good story, so especially in keeping with my Western bias, I’m going to say that this has contemporary historical and cultural relevance. Really, you need to decide for yourself. This is a great article Tabitha. The notion of art for art’s sake is very much a statement of the cultural shifts Chinese artists have witnessed for themselves over the last few years. Obviously there are boundaries remaining, for some more than others, but I love the very idea of there being windows yet unseen from and for artists old and new. I like that you’ve referenced the idea of space, this is something perhaps too few people have given thought to. Commerce will of course continue to change that, alongside new money and wealth, which coincides nicely with the appearance of more expressive works from the likes of Liang Wei. as we have talked about drawing and became friends. However, his sudden disappear has lost contact for many years.